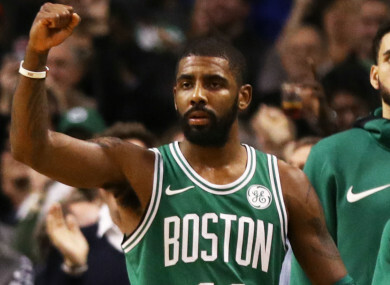 THE BOSTON CELTICS extended their winning streak to 15 games as reigning NBA champions the Golden State Warriors produced a stunning comeback to stop the Philadelphia 76ers. Boston maintained their unbeaten run with a 110-99 win over the Atlanta Hawks on Saturday. The Celtics erased a 16-point deficit as Boston now enjoy their fight-longest winning streak, four behind the 2008-09 team. Jaylen Brown had a career-high 27 points for the Celtics, while the Hawks were led by Dennis Schroder’s 23 points. Brad Stephens wanted the Celtics to play better offensively and Kyrie Irving did just that. He was incredibly efficient going 10-of-12 shooting from the floor and five of six from three-point range on his way to a 30-point, five-assist and four-rebound performance. Stephen Curry scored 35 points as the Golden State Warriors bounced back from a disastrous first half performance to overpower the Philadelphia 76ers 124-116 on Saturday. Curry erupted in a one-sided third quarter for the Warriors after the Sixers had stunned the reigning NBA champions with an astonishing 47-point first quarter display at Philadelphia’s Wells Fargo Center. The points haul was the most the Warriors have conceded in a single quarter since giving up 48 points in the fourth quarter of a game against Portland in November 1992. The Sixers led 47-28 after the first period and extended their lead to 74-52 at the break, leaving the Warriors staring at a potential blowout loss. However Steve Kerr’s men came roaring back after half-time, and with Curry and Kevin Durant to the fore, put up their own 47-point quarter in the third. Curry rattled in 20 points alone in the third quarter as the Warriors erased a 22-point Sixers lead and quickly accelerated clear of their rivals. By the end of the third, the Warriors had raced into a 99-89 lead, a comfortable buffer they never looked like relinquishing throughout the fourth. Curry finished with 35 points, five rebounds and five assists, while Durant weighed in with 27 points five rebounds and three assists. “They played well in the first quarter so you’ve got to credit them,” Curry said afterward. “Sometimes when you get down like that it’s not all our fault. We helped them a little bit with some turnovers and easy three-pointers, which gave them momentum, especially at home. Bucks guard Eric Bledsoe did not help his team’s cause in the loss going two of 10 from the floor with six points, four assists, four rebounds and two turnovers. Los Angeles Clippers guard Austin Rivers was quiet from the field in his team’s 102-87 loss to the Charlotte Hornets, going three-of-14 shooting and one of six from three-point range with nine points, four rebounds and three assists. It was a night of efficiency in the NBA as Utah forward Derrick Favors also went 10 of 12 from the field with 25 points and 11 rebounds in the Jazz’s 125-85 rout of the Orlando Magic. Mavericks guard Wesley Matthews continued the trend, going eight of 14 from the field, but an even better six of eight from beyond the arc on his way to 22 points on the night in Dallas’ 111-79 win over the Milwaukee Bucks. He also added eight assists. Portland Trail Blazers guard Evan Turner loves playing in transition as is shown in how he treated Sacramento Kings’ George Hill in a 102-90 win. Email “Kyrie on fire as Celtics win 15th straight, while Curry leads Warriors fightback against 76ers”. Feedback on “Kyrie on fire as Celtics win 15th straight, while Curry leads Warriors fightback against 76ers”.